200-gram pressing by Quality Record Pressings via Direct Metal Mastering! Rush celebrates the 40th anniversary of their classic 1974 self-titled debut album with a new vinyl boxset, Rush ReDISCovered. The legendary Canuck prog-rockers are reissuing the original Moon Records (pre-Anthem/Mercury) studio album as part of Universal's reDIScovered vinyl series. Rush's very Zeppelin-esque 1974 debut features John Rutsey on the drums, pounding along with Geddy and Alex on "Finding My Way," "Working Man" "Before and After," and more. This really rocks, but the Rush sound we know today (and Neil Peart) were still to come. This album was last remastered in 1997. This box set version was remastered at Abbey Road studios by engineer Sean McGee, who has been responsible for the recent Beatles vinyl remasters. The album comes in a high quality 12-inch box and is pressed on 200 gram vinyl at Quality Record Pressings via the Direct Metal Mastering process. 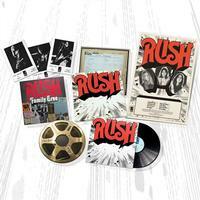 The package includes the original jacket art, complete with MN-100-A/B etching, a 16"x22" reproduction of the rare original 1974 Canadian retail poster (of which only 500 were originally printed), individual Moon Records publicity 5x7 photos of Geddy Lee, Alex Lifeson and original drummer John Rutsey, as well as a 12"x12" Rush Family Tree poster, and a download card for a free digital copy of the remastered album. As far as the package goes, I really don't think any of the extras have much interest. I could have done without all of it and settled for just the vinyl at a lower price. As for the music...It's Rush, what else can I say? I've gotten some really good remasters from Mofi and Analogue Productions lately and this is not quite at that level, but it's very good nontheless. The vinyl seems very quiet and flat. I wish somebody would release more of their classic albums. They would sell like crazy.